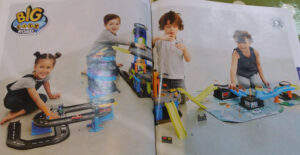 Despite a few positive signs, our new research shows that the promotional images used in toy catalogues represent children’s play along highly stereotyped lines, with only a handful of boys shown with dolls, and boys four times as likely to be seen playing with cars or other vehicles. These tired stereotypes don’t reflect the breadth of real children’s play, and limit children’s freedom to choose their interests for themselves. 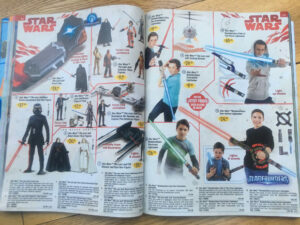 Children take messages about what’s ‘for girls’ and what’s ‘for boys’ very literally, so when they see a catalogue spread featuring only girls or only boys, it reinforces the idea that certain activities or interests are not for them. It’s hardly surprising then if children grow up thinking that certain interests or jobs are more for men or for women. These limiting stereotypes, learned early, are hard to shake off. and do real harm to children’s learning and development. Marketing and advertising – not to mention the toy industry itself – are supposed to be creative industries; we’d like to see a lot more creativity and diversity in the way toys are promoted to children. Volunteers reviewed Christmas toy catalogues from Argos, Toys R Us, Tesco, Entertainer, Early Learning Centre and Smyths toys to produce our research. 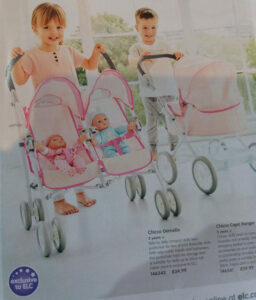 While there were some individual examples of inclusive images, particularly in Tesco and Toys R Us own brand/exclusive products, Early Learning Centre’s catalogue was the only one where children were shown in a balanced way. Download full report. Most of the imagery provided by manufacturers to promote their toys seems to stick to a pretty limited script. Most catalogues had areas that were ‘no go zones’ for one gender or the other, eg whole spreads of vehicles or Nerf blasters featuring only boys, or whole spreads of baby dolls, collectibles or art/craft materials featuring only girls The Smyths catalogue had 16 solid pages of dolls without a single boy to be seen. Girls were nearly twice as likely to be shown with kitchens or other ‘domestic’ play. It might be slow, but we’re seeing progress compared with 2016’s catalogues. In 2016 just 11% of children shown with toy vehicles were girls, mostly shown with pink versions of toys. This year it was 19%, with far fewer ‘also comes in pink’ versions. 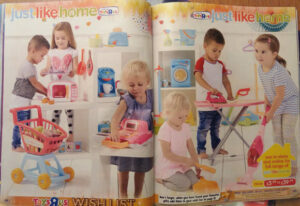 Last year only one catalogue featured a boy with a baby doll (ELC). This year three catalogues out of five did (though Tesco and Toys R Us included only one each). Tesco, Toys R Us and Early Learning Centre all included more inclusive photography for their own brand toys – retailers seem to be leading the way on this. While paper catalogues might seem a bit old hat, toy retailers still distribute them in their thousands in the run up to Christmas. We know that children take very seriously the cues and nudges from marketing about what’s suitable for a boy or a girl, and may be put off asking for a toy that interests them if catalogue imagery make them feel they’re not ‘meant’ to want it. Why does the toy industry need to change tack? A wide range of play is important for children’s learning and development, and parents are increasingly recognising the importance of allowing children to follow their interests without fear of choosing the ‘wrong’ thing. A recent survey of Australian parents found that 92% of parents of 0-3 year olds felt that it was important that boys and girls should be treated the same, and that 79% wanted to take action to challenge traditional gender stereotypes. Another international survey of parents found that a majority thought that children should be raised in as gender-neutral a way as possible to guard against stereotypes. Toy retailers and manufacturers who rely on outdated ideas about what boys and girls are meant to like risk falling out of step with what parents want for their children. Consumer attitudes are changing, and the toy industry is starting to recognise that developing and marketing toys according to rigid gender categories is not the future. Research suggests that girls in particular are increasingly fed up with a patronising reliance on stereotypes in marketing, which can actively put them off. The Advertising Standards Authority’s 2017 report Depictions, perceptions and harm signalled the intention to develop much tougher standards on gender stereotypes in advertising to children and adults. The ASA is due to report on progress towards new guidelines before the end of 2017. 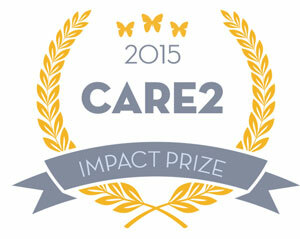 We’d like to see more innovation and creativity from a creative industry! More mixed-gender groups – this is a great way to signal to children and adult buyers that this toy is fun for boys and girls. More examples of children playing outside of narrow stereotypes. 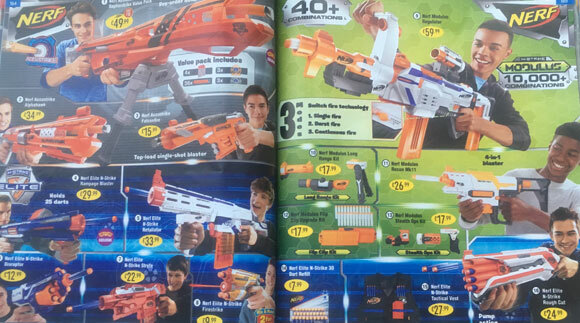 Avoid ‘all-boy’ or ‘all-girl’ spreads (eg Nerf, dolls, art/craft, vehicles) Retailers need to be mindful of the overall effect of a catalogue spread or section. If only girls or only boys are shown in a particular section, children will draw their own conclusions.